Fra Bartolomeo (1472–1517), The Scene of Christ in the Temple (1516), oil, 155 x 159 cm, Kunsthistorisches Museum, Vienna, Austria. Wikimedia Commons. The Florentine friar Fra Bartolomeo (1472–1517) had recovered from his self-imposed exile from painting following the martyrdom of Savonarola, and by about 1508 was considered the leading painter in one of the leading centres of the Renaissance. In 1513 or 1514, he travelled to Rome, where he worked on frescoes as well as easel paintings, bringing his career to its artistic peak. While in Rome, his friendship with Raphael continued to bring mutual benefit to their painting. Fra Bartolomeo (1472–1517), Minerva (1510s), oil, 47 x 31 cm, Musée du Louvre, Paris. Wikimedia Commons. 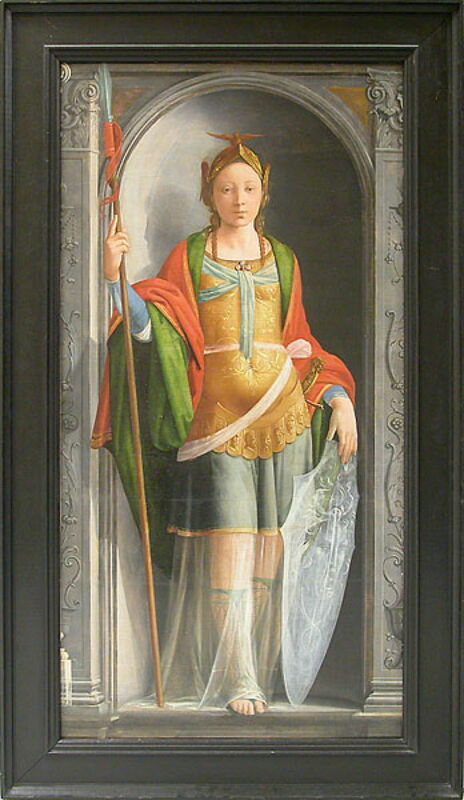 So few of Bartolomeo’s secular works have survived – largely as a result of destruction by his own hands of earlier examples in 1500 – and this full-length portrait of Minerva from the 1510s suggests how tragic is this loss. In addition to the standard attributes such as her spear, armour, and unusual helmet, the artist has shown her Aegis in a unique form. This shield bearing the image of Medusa’s head is here made from a semi-transparent material which today we might relate to holography. Her robes are finely rendered, with a superb diaphanous skirt. 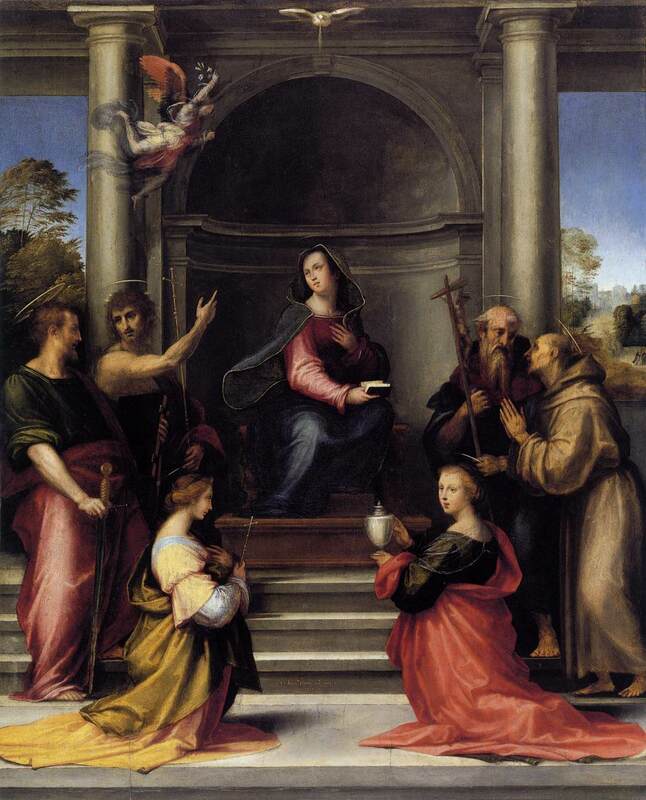 Fra Bartolomeo (1472–1517), The Incarnation with Six Saints (1515), oil on panel, 96 x 76 cm, Musée du Louvre, Paris. Wikimedia Commons. His The Incarnation with Six Saints (1515) shows the Virgin Mary enthroned and surrounded by six saints, two of whom are women. Above Mary is the Holy Spirit, in the form of a white dove, and at the upper part of the left pillar is the angel Gabriel, bearing the white lily of the Annunciation. The most clearly-identifiable of the saints is Mary Madgalen(e), kneeling at the right and holding her container of myrrh. The saint immediately to the left of the Virgin Mary is John the Baptist, and the others are likely to include Jerome and possibly Saint Francis of Assisi. This was commissioned for King Francis I of France (1494-1547), who was crowned in Reims in January 1515. Fra Bartolomeo (1472–1517), Madonna and Child with Four Angels (1515), media and dimensions not known, Hermitage Museum Государственный Эрмитаж, Saint Petersburg, Russia. Wikimedia Commons. 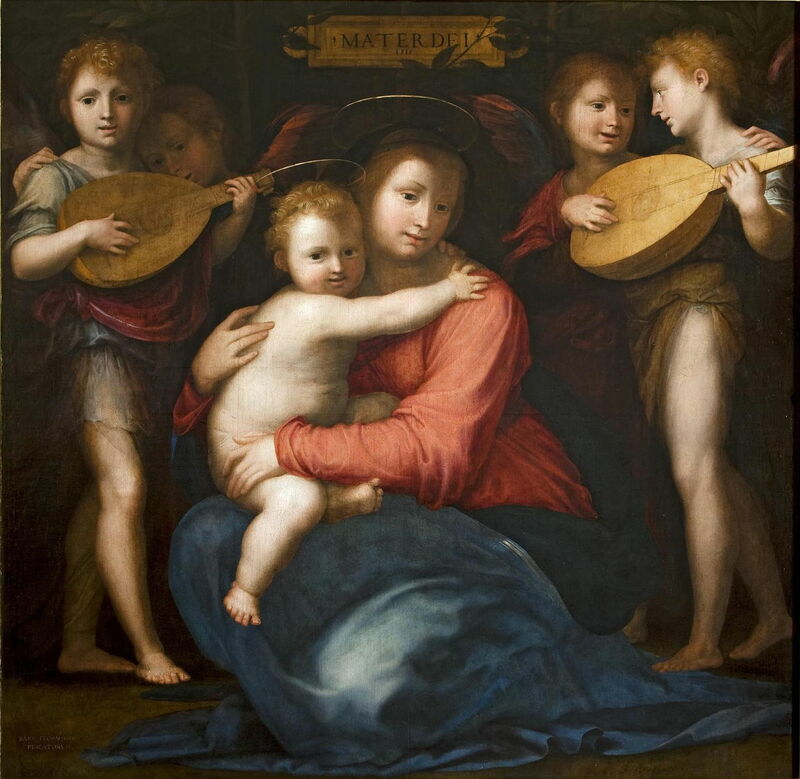 Fra Bartolomeo’s Madonna and Child with Four Angels (1515) is a wonderful variation on the customary motif of the Virgin and child, with its emphasis on children and childhood. The inscription Mater Dei makes it absolutely clear that Mary is shown as the mother of God. 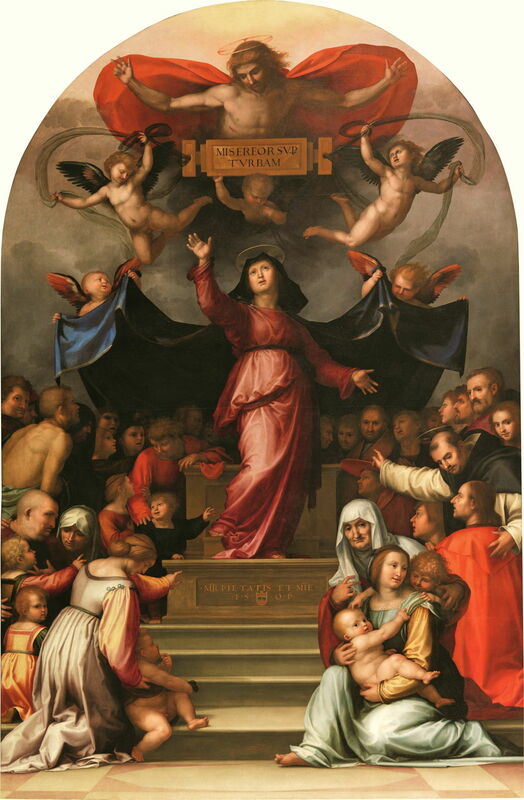 Fra Bartolomeo (1472–1517), Madonna della Misericordia (1515), oil on canvas, dimensions not known, Museo Nazionale di Villa Guinigi, Lucca, Italy. Wikimedia Commons. Madonna della Misericordia, also from 1515, shows another role of the Virgin Mary as the Madonna of Mercy. This is perhaps best-known from Piero della Francesca’s polyptych in Sansepolcro in Tuscany, Italy, which Fra Bartolomeo may well have seen. Older versions normally showed small people sheltering under the Madonna’s cloak, as does Piero, but Bartolomeo achieves this with greater ingenuity and a firmer root in reality. The inscription at the top, underneath the body of Christ crucified, is Misereor sup(er) turbam, a quotation from Jesus’ words as given in the gospel of Mark, chapter 8, verse 2, meaning I have compassion on the crowd, which is the theme. 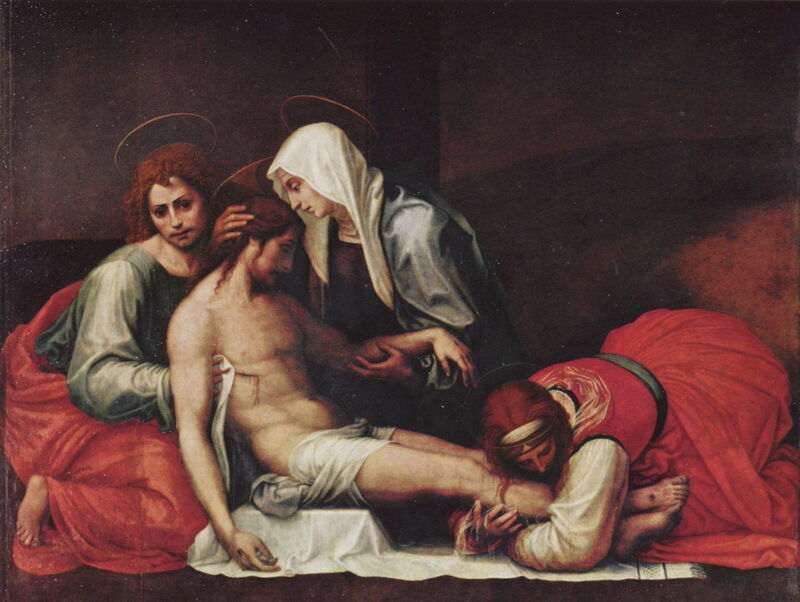 Fra Bartolomeo (1472–1517), The Burial of Christ (1516), color on wood, 158 × 199 cm, Palazzo Pitti, Florence, Italy. Wikimedia Commons. The Burial of Christ, from 1516, shows the same motif as his earlier Pietà from 1511-12, but here against a plain background, without the additional figures of the earlier painting. 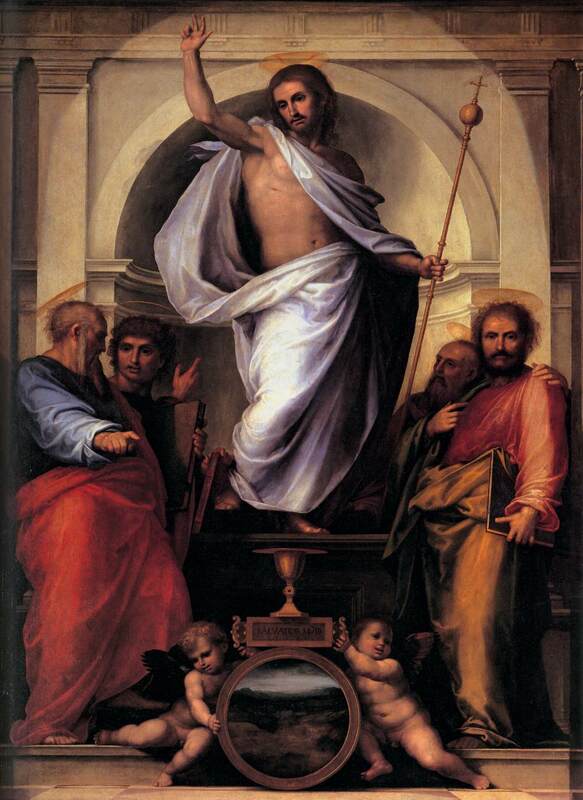 Fra Bartolomeo (1472–1517), Christ with the Four Evangelists (1516), oil on canvas, 282 x 204 cm, Palazzo Pitti, Florence, Italy. Wikimedia Commons. Christ with the Four Evangelists (1516) shows another enduring and popular religious composition, the risen Christ with the stigmata of his crucifixion, surrounded by the authors of the four gospels of the New Testament. Often associated with their animal symbols for ease of identification, I suspect that Bartolomeo has shown them here in the conventional order of the gospels, with Matthew and Mark at the left, Luke and John at the right. At the foot is the inscription Salvator Mundi, Saviour of the World, and a landscape on a tondo. The Scene of Christ in the Temple (1516) continues Bartolomeo’s series of motifs of children and the family, which seem to have taken over from his earlier mysticism. This shows the infant Jesus brought by Mary and Joseph to the Temple in Jerusalem, when he was forty days old, in accordance with the law of Moses for first-born male children. Traditionally this is known as The Presentation of Christ in the Temple, with Mary and Joseph meeting Simeon and Anna, a pious widow. 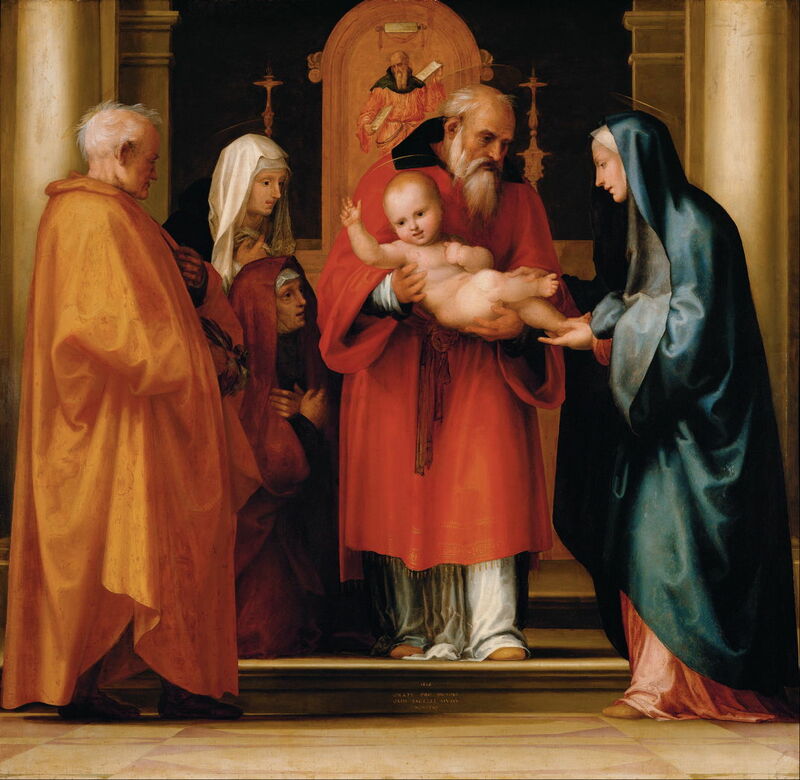 Simeon recognised the infant as the Messiah, praised God, and said that he could now die at peace in the knowledge that the Messiah had come – a prayer known from its opening words in Latin as Nunc dimittis. It is remembered in the festival of Hypapante (Greek for meeting), which is now widely known as Candlemas in northern Europe. Fra Bartolomeo (1472–1517), Worship of Venus (c 1516), black chalk, 22 x 29 cm, Galleria degli Uffizi, Florence, Italy. Wikimedia Commons. 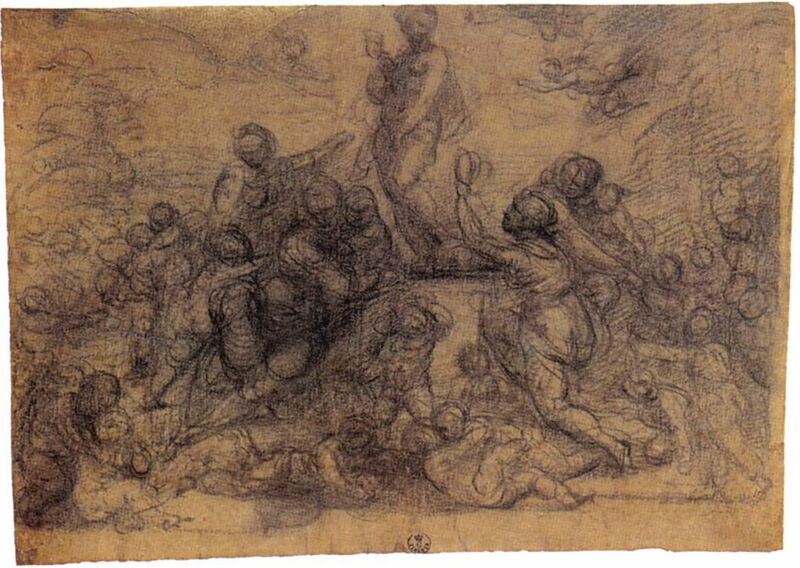 Some of Fra Bartolomeo’s late sketches have also survived, among them this compositional sketch in black chalk for a proposed painting of the Worship of Venus from about 1516. Alfonso d’Este, the Duke of Ferrara, had commissioned several artists to provide paintings to decorate his private apartments: Fra Bartolomeo went to Ferrara to receive his instructions in 1516, and produced this preparatory sketch. However, he never started the painting, which was handed over to Titian to complete by 1518. 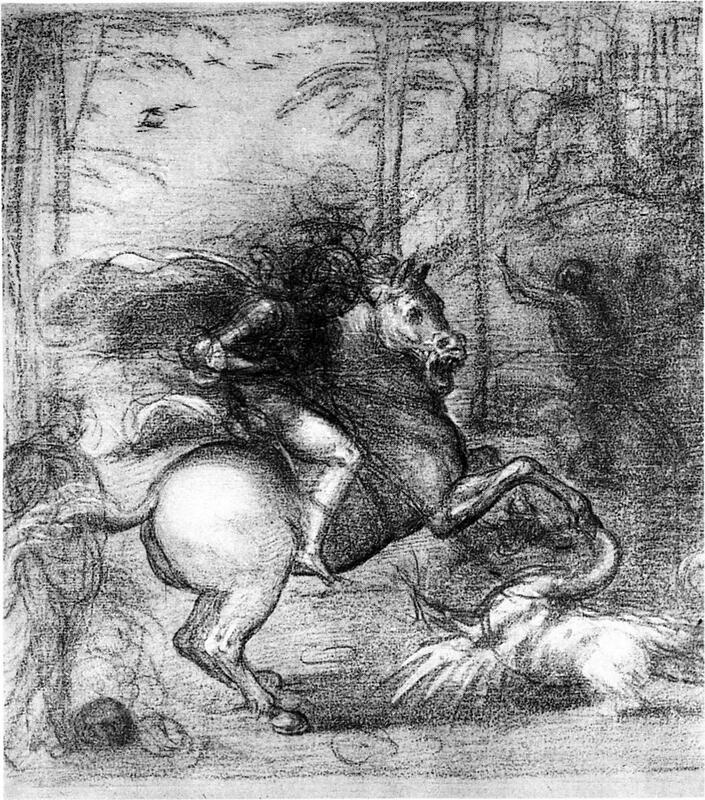 Fra Bartolomeo (1472–1517), Sketch for St. George and the Dragon (date not known), media and dimensions not known, Museum Boijmans Van Beuningen, Rotterdam, The Netherlands. Wikimedia Commons. He also made a series of preparatory sketches for St. George and the Dragon, of which this probably gives the best idea of how the painting might have looked. It is thought that these might date from about 1509, but as far as I know there is no trace of the finished painting. Fra Bartolomeo died in Florence, on 31 October 1517, at the age of only 45. The workshop at San Marco did not last long after his death. In the centuries since, the number of his surviving works has steadily dwindled, and Raphael’s reputation has grown. In the final article I will compare some of Bartolomeo’s paintings with Raphael’s, and argue my case for Fra Bartolomeo’s better recognition. Posted in General, Painting and tagged Bartolomeo, Bartolommeo, Fra Bartolomeo, landscape, painting, Raphael, renaissance. Bookmark the permalink.